If you need to note an event or reminder to help you with scheduling, you can easily add it to your calendar. Hover your mouse pointer over the date and you will see a + appear. Click this, and a popup window will appear where you can enter notes. Click the Save button, and you will now see that there is a small i next to the date indicating there are notes for that day. 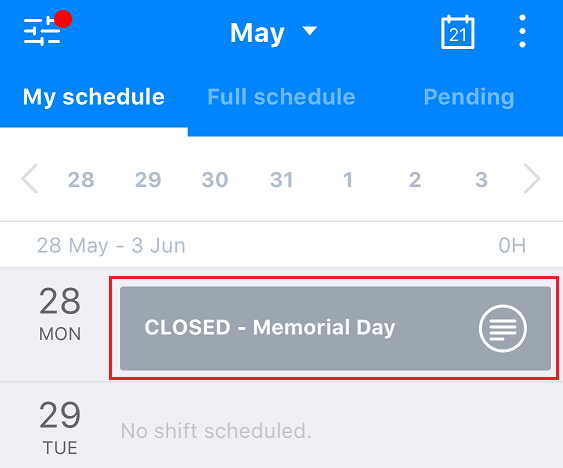 Although day notes aren't visible from the main view on the website, you will see them displayed in the main view of the app, so employees will be alerted to important info without having to search for it.